A little yoga does a lot of good. Weight loss is achieved by permanently changing the metabolism. 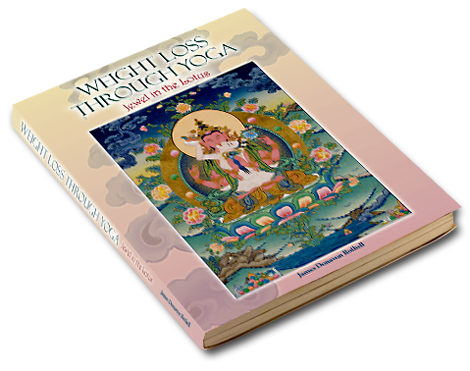 Without dieting or strenuous exercise, release the ideal expression of your true self in body, mind, and spirit. Release the healthy, more joyous person you intuitively know is coiled inside you. The practice is accessible to everyone while providing valuable insights for even the most experienced yogis. The body’s metabolism can be readjusted without strenuous exercise or dieting, allowing the body to find and maintain its ideal form. Most westerners are only familiar with yoga as a form of sophisticated calisthenics, emphasizing a small portion of its total expression. Yoga is a much deeper holistic science that affects the whole being; body, mind, and spirit. Jewel in the Lotus explores the metaphysics and philosophy that evolved as ‘yoga’ through thousands of years of quiet introspection. First a Morning Ritual is shared that will foster rapid change. Weight control is the vehicle used to explore an alternative way of perceiving the body and what it means to be human. After introducing the reader to the fundamentals of yoga, a Ten Minute Complete Yoga Workout is presented that stretches and tones the entire body efficiently. The reader, through a Yoga Nidra and a Kundalini Meditation, is guided into the realm of universal consciousness and shown how to participate in the creation of reality. Jewel in the Lotus reveals previously unexplained concepts and techniques. This bridge between Eastern and Western thought is crossed for the first time, providing valuable insights for even the most accomplished yogis.